When one thinks of Mongolian cinema, one name immediately springs to mind: Batdorjin Baasanjav, best known for his portrayal of Genghis Khan in the 2004 Chinese-Mongolian TV drama of the same name, as Khan’s father Yesugei Baghatur in Sergei Bodrov’s 2007 biopic ‘Mongol’, and as Guan Yu in John Woo’s Three Kingdom’s era epic from 2008 ‘Red Cliff’. A descendent of Khan himself through his second son Chagatai, the word legendary seems all-too befitting for his very embodiment of his roles, delivering a wholly believable yet captivating performance time and time again. On paper then, it would seem to be the perfect casting choice for Tsahir, leader of one of Khan’s ten-men military units (or aravt) in Jolbayar and Shagdarsuren’s wonderfully shot film retelling this particular legend. Baasanjav aside, does ‘Legend of the Ten’ hold up in the emergence of Mongolian film-making? Short answer: yes, it does. 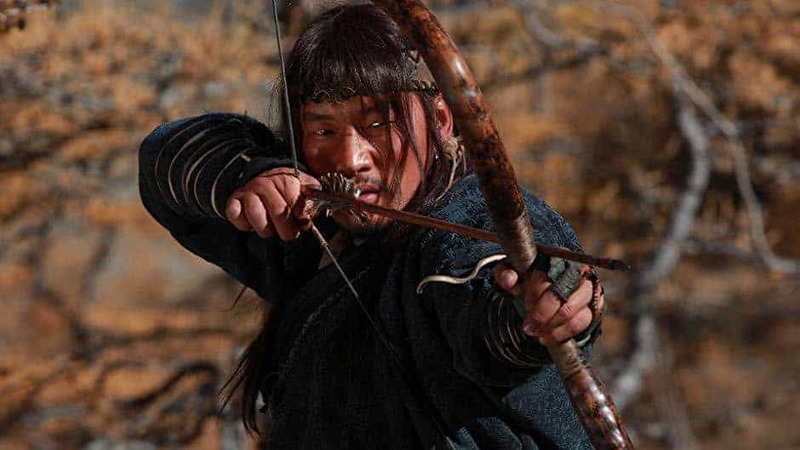 Shot primarily in the mountainous woodlands of Mongolia, ‘The Legend of the Ten’ follows a unit of men let by Tsahir, who has been tasked with tracking down a Master Physician in order to cure Khan’s soldiers from a plague. On their journey, they discover a decimated encampment, haunted by the cries of its lone infant survivor whom they save from a seemingly harsh fate. Little do they know the baby is the son of Harkhor (G. Zolboot), a leader among the Hulin rebels, who hunts them down believing it was they who killed his family. Once the aravt catches up to the Master Physician and his granddaughter (a minimal yet crucial role performed with soul from Dorjgotov Gantsetseg) their mission turns complicated upon realising the two have been taken in by Harkhor’s father Hukhtumur (Ayurdadi). Skirmishes turn bloody as the aravt and rebels gear themselves towards the film’s final battle. Steeped in as much historic folklore as it is in human drama, ‘The Legend of the Ten’ chooses to, perhaps wisely, deter itself from relying on combat and battle sequences and instead focus on the human elements. Fleshing out the soldiers, each with their own distinct personality, their camaraderie alone puts many Hollywood ensemble films to shame: unbreakable bonds are often romanticised but here there is a true sense the ten have grown as a unit together and fought many battles side by side; their moments of bonding by the fire, sharing music, and teasing their cook Bukhtenger (N. Onon) into taking care of the baby (with whom the story tends to centre around) are pure and heartfelt. Even the motivations behind Harkhor and his father and the shady Bukha (C. Ariunbyamba) elevate them beyond typical villainy. Bringing everything they have into their roles, the actors fill every scene with charm and charisma, making the characters their own and thus bring this legendary tale to life. It is then best to approach this film not as a medieval epic filled with battles but more of a human story. The battle scenes themselves are superbly choreographed and shot but at times feel a little stilted; this is especially true when considering the moments of slow motion and other timing effects which come across as a little cartoonish, but this does little to impede the impact of such moments. The emotions are raw here and once again are heavily dependent on the strengths of the actors to manifest the heaviness of the situation. One particular moment during a skirmish for example shows Harkhor comes close to reclaiming his son; it is almost heartbreaking to watch as he sees him being saved by aravt and taken far from the battle. Perhaps it is these moments which seem to have confused Western audiences in the past. Taking its time to develop, this is a film packed with plenty of detail, courtesy of the costume design and a sweeping score from composer B. Chinbat, blending traditional instrumentation with rousing Hollywood epic-style numbers; at times its soundtrack becomes too invasive, but this is seldom an issue here. G Battolga’s cinematography beautifully captures the Mongolian wilderness in almost every angle possible, and the framing of the characters is certainly befitting of their personas. Overall, the film’s warmth radiates even if it is occasionally let down by off-pacing and über-theatrical editing. The bedrock then, it must be said, is its strong ensemble led by Baasanjav’s heroic demeanour; with each passing scene the legends continue to grow, presented in a simmering fashion for those who get the chance to pick this up. Picking up five prizes at Mongolia’s Academy Awards including ones for directing, supporting actress, and art direction, Jolbayar and Shagdarsuren’s film intricately weaves a tale of military brotherhood whilst sidestepping clichéd cinematic action. It’s a refreshing subject for an all-too mined aspect of Mongolian history and approaching it with new eyes adds a previously unforeseen depth to the stories of such a past. Whether the stories here are historically accurate or not is besides the point, ‘The Legend of the Ten’ reconnects our need for myths and folklore at a time where they are slowly dying out, especially as far as film-making goes. Films like these are the reason more need to pay attention to the cinema from this part of the world.